BFGoodrich have proven their skills in making tyres tough enough to conquer any challenge, from numerous Paris-Dakar Rally and World Rally Championship wins to providing tyres for the SR-71 Blackbird stealth jet. BFGoodrich put this unique experience and knowledge into their entire range of tyres, meaning that their tyres are more than capable when it comes to both on and off-road performance. To find more information on BFGoodrich tyres, try our 'Find Your Tyres' selector. You can also visit your nearest ATS Euromaster centre, where our expert technicians will help you choose the right tyre for your needs. BFGoodrich G-Grip - This tyre has a vortex tread pattern for better braking and handling, providing excellent performance on wet roads and uneven road surfaces. With shoulder & central rib tread blocks for rapid steering response, the BFGoodrich G-Grip tyre is the perfect everyday tyre. BFGoodrich All Terrain TA KO2 - This Off Road 2018 award winning tyre has 20% tougher side walls and 15% more on/off road miles than its predecessor, making it BFGoodrich’s toughest ever all terrain tyre. BFGoodrich Mud Terrain TA KM2 - Alternating tread blocks for better terrain coverage is what sets this tyre apart from the rest. With a trigard architecture to enhance endurance, this is the perfect off-road tyre for any vehicle. One area where BFGoodrich really shine is in their range of off-road tyres which are used by amateur off-roaders to professional racing teams, thanks to their excellent grip and durability on all terrains. Rocks and jagged edges can be fatal to off-road tyres, so tyres that are strong enough to cope with these hazards are a must, especially when travelling over longer distances; this is why BFGoodrich tyres have been responsible for wins at the Dakar Rally, Baja 1000 and World Rally Championship. BFGoodrich excel when it comes to the tarmac as well, with countless racing victories over a number of years that have helped develop reliable tyres that grip even in harsh weather. 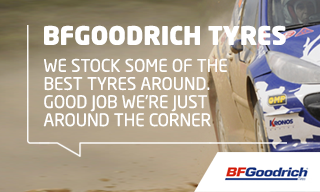 This racing pedigree has allowed BFGoodrich to create tyres that last for long over long distances while providing unparalleled traction in the corners and guaranteeing safety in the wet.